Flashback Friday: In Your Hat! There are a lot of ways to land a fish but I think most people would agree that, for most of the fish they are likely to encounter, using a net is best. This fellow looks pretty fresh, considering he’s been fighting a demon. I bet he ties all his own flies. He might even make his own nets. Of course, those deep nets with the wide, string mesh are things of the past. So are $1 net making kits. 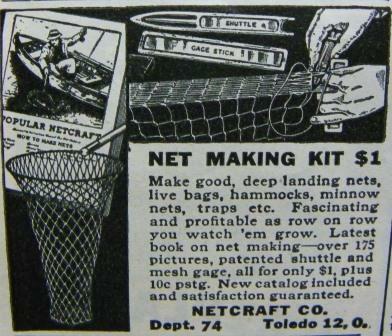 These days, one can spend as much as one wants on a net making kit, even more for a net already put together. There are nets with short handles and nets with long handles, made from a wide variety of materials. Some have bags of cloth mesh, some still use old-fashioned string or nylon twine, while others use spooky, modern, rubber-like proprietary materials. How does one choose the most appropriate net to use? 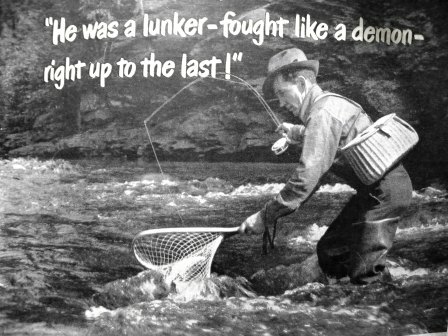 It appears that most of us have been using the wrong net, if the practitioners of that horribly complicated scourge, Tenkara, are to be believed (Tenkara Net, $85.95). If only there were a way to have a net handy, right when you need it, yet barely noticeable when you don’t! 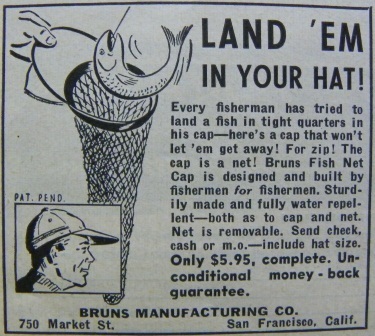 A hat and a net, all in one, for under six dollars! While you’re fightin’ those demons with one hand, simply reach up with the other, remove your cap, undo the zipper, pull out the mesh and you’re in business! What could be easier? After all, who can resist the charms of a rugged outdoorsman with a wad of soggy, slime-coated netting tucked into his hat? And I’ve heard that Bigerrfish lands fish with his bare hands! No pole, no net…I really need to see that! I would at least need a net…haha. That image makes me a little, well, eeewwww…..
I’m picturing slime and green gooey stuff, and the water dripping down his face…. HAH! I reckon that pretty well sums it up.